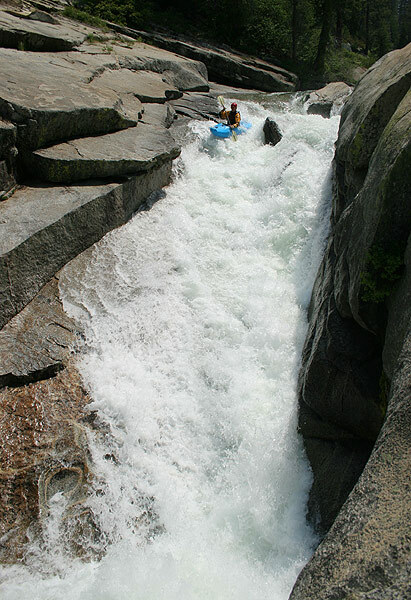 Nature: A narrow steep creek with endless granite slides and falls. 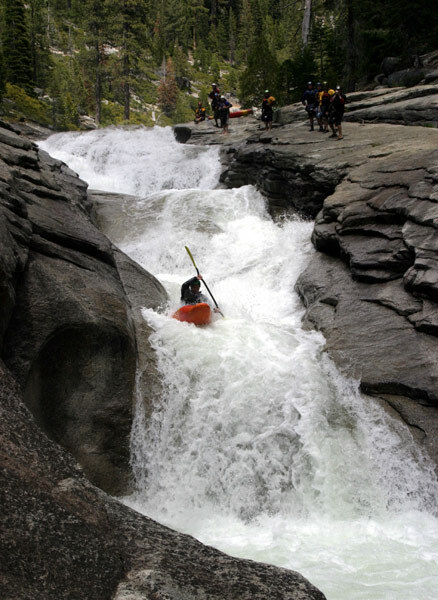 Copyright © 2007, Oregon Kayaking, Ben Zupo, Jon Fowlkes, and Mike Long. 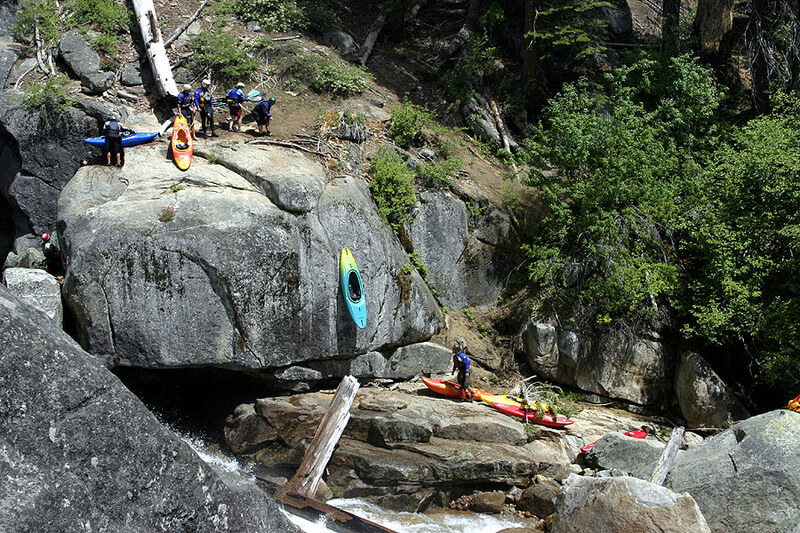 No part of this page may be reproduced, linked, or copied without the express written permission of the Oregon Kayaking webmaster, Ben Zupo, Jon Fowlkes, and Mike Long. Rumors were running high as we pulled out of Sierra City and headed towards the infamous South Silver. Some reports said it was too high, some said it was OK. We figured it would be on the high side but probably doable..
After camping nearby, we rolled into the parking lot at the put in. When we got out of the car Mike ( who has run South Silver before ) said: "Ohhh.. that’s loud.." referring to the roar coming from the creek. Mike's boat had cracked the previous day, so we set about fixing it. After some quick work with a knife and a roll of duct tape, we pronounced that his boat was "good to go". We walked to the put in and immediately went for a 150 yard scout of Autobahn, a super fun low-angle slide. With a big grin and a twinkle in my eye, I hopped in my boat for an exhilarating start to the day. Mike followed suit and we were on our way downstream..
Mike Long fires up Autobahn, the long, fast, exhilarating first drop on South Silver. A few short drops later and we scouted a steep, bouldery drop with the potential for a big orthodontist bill. Without too much thought, we did the easy portage on the left. Unfortunately, Mike dropped his paddle during the portage and it slid down the granite shelf into the creek. 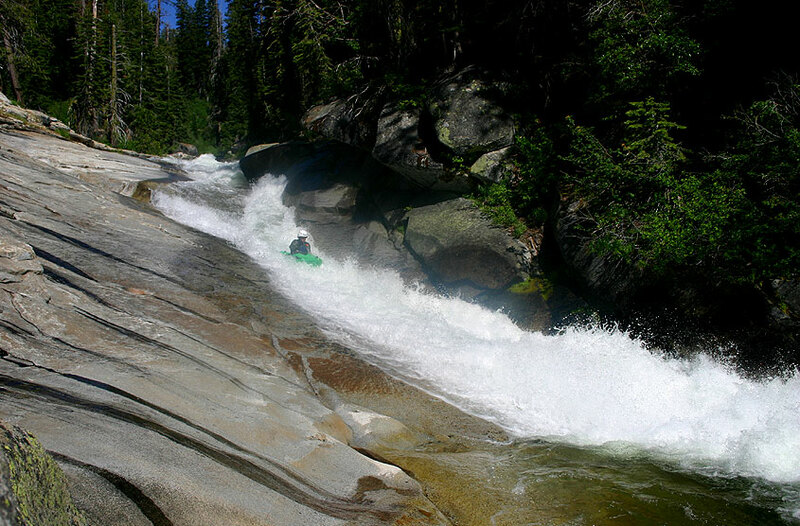 We both quickly took off downstream after the paddle, scrambling down the granite highway. After every horizon line, I could just see it in the pool below, headed towards the next horizon line. Finally, after the last teacup, I caught the paddle as it drifted near the bank and headed back up to find Mike. 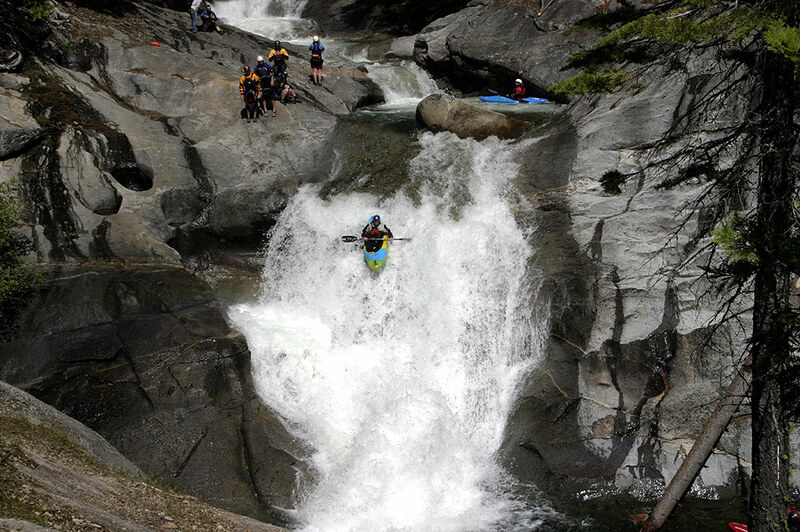 Since we had already scouted Triple Drop during the paddle pursuit, we ran right, middle, middle and we were down triple slide, where we got out for the first big one, known as 'Boof Boof Slide'. Chris Wilson finishes up a nice run down 'Triple Slide'. Boof Boof Slide went well and we were off to the next big horizon line, smiles on our faces..
Jon Fowlkes drops into 'Boof Boof Slide'. Downstream of Boof Boof Slide are the Teacups, a series of six ledges and falls ranging from three to fifteen feet tall. However, there was only one eddy between us and the infamous Skyscraper/Offramp combo so we once again went for a long scout. The teacups looked all right (with some pretty good holes but they were avoidable) then we peered down into Skyscraper where the river drops over a huge horizon in a three part drop ending with a big hole which washed straight over the thirty-plus foot dome shaped 'Offramp'. This, while a little overwhelming, all looked clean and good except that you only have fifteen feet at the bottom of offramp to get into the eddy before the entire river flushes into a huge sieve/undercut cave combo. Before seriously contemplating Skyscraper, we ran the Teacups without problems, staying generally left to avoid various unfriendly features in the landing zones.. Finally Mike decided to probe Skyscraper while I made a flying twenty-foot leap off the cliff into the eddy at the bottom of Offramp to set up safety at the sieve. After a bit more scouting I saw Mike head up for his boat. I was a little concerned at this point because he had five teacups and several large holes to deal with, all while essentially flying solo. However, all I could do was wait at the sieve and hope he did alright. After what seemed like an eternity of waiting, I saw him drop over the top of skyscraper and just barely caught a glimpse of orange as he melted through the last ten foot drop straight into the gut of the big hole. Now, from scouting this section, I knew that if he got through that bottom hole, it would only be about five seconds until he came over the top of offramp. Five seconds.. ten seconds.. thirty seconds..
Well, he’s in the hole somewhere. After a minute I picked up the camera, fiddled with it trying to make it work, it’s still not working, so I put it back in the bag and picked up the throw rope. Decision time: Do I leave the sieve and go to rope him out of that hole? Is he swimming and stuck in the cave? No Jonathan, I tell myself—no matter what happens, I need to be here: if he blacks out, I’ll have to keep him out of the sieve—if I run upstream, he might come out of the hole while I’m going up there.. what to do, what to do..
Somewhere in this thought process, Mike appeared at the lip of offramp, comes screaming down and catches the eddy with a huge whoop and holler. Waves of relief rolled over both of us as he relayed the deep and philosophical discussion he had been in for the last few minutes with that hole..
Ben Zupo Photography runs Skyscraper. We portaged the manky looking sieved out/woody section just below this. 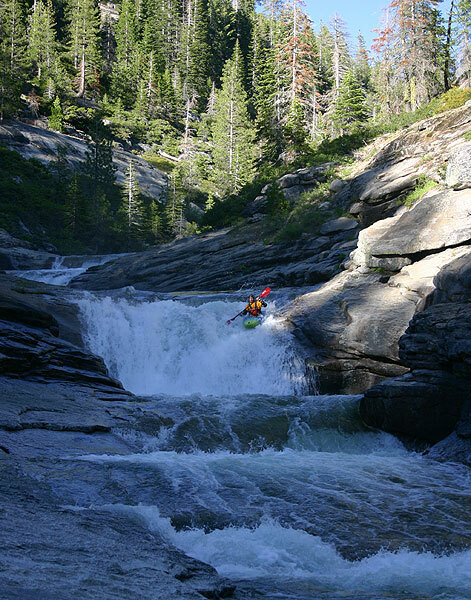 A good team effort makes the portage faster..
Downstream we dropped through another fantastic series of twisty ledge holes which led the lip of a thirty foot falls. Here, all the water appeared to be piling into a big rock outcropping creating a huge pillow then flushing downstream into a pool. On first scout I thought: "No Way!!". This thing looked terrible, but Mike assured me drop, aptly-named 'Plastic Surgery' was, quote: "Super soft—you just land in the pillow and it’ll flush you out the bottom." Well, I guess it’s flushing so I jumped in my boat and followed suit with similarly great results! Too much fun! Chris Shields runs Plastic Surgery. The more water you have, the friendlier this drop will be. A final series of fun teacups and we were at the takeout. What a run! I jogged the mile and a half shuttle back up the river, then drove the car down and we celebrated a great day as we headed off for some park and huck by Shasta.. 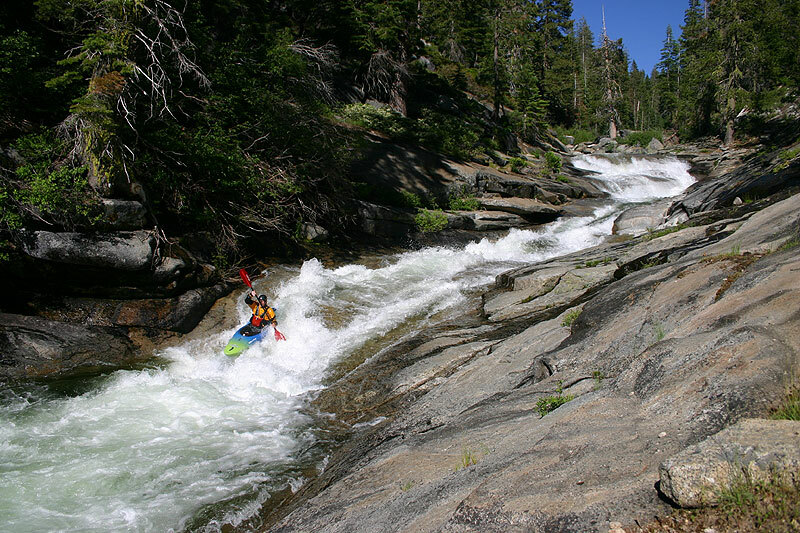 Flows: South Silver is a snowmelt run with a very short optimal flow window, which varies depends on the snowpack. In big snow years ( like 2006 ) you get a pretty good window, maybe two or three weeks of water, ranging from mid-to-late June into the first or second week of July. A safe bet would be the last two weeks in June and maybe the first week in July if you're lucky. Directions to the take out: Coming from Placerville on Highway 50 take Icehouse Road, turn left after about twelve miles to Wrights Lake, after about a mile and a half look for a right turn to Strawberry Campground. Drive a couple of miles to the end of this road, you can hike down to Skyscraper from here. Directions to the put in: It is pretty easy to jog the mile and a half back up the creek to the put-in, or you can drive five or six miles. If you want to drive, head back out to the Strawberry campground turn and turn right. After about three and a half miles turn right onto a paved road, go straight through the intersection, then after a half mile turn right and continue to the end of the road. Follow your ears to Autobahn from here ( take the time to find the trail to the pool above Autobahn, it makes your life a lot easier than trying to find your own way down into the canyon ). According to Google Maps, it is a 9 hour, 45 minute drive from Portland to Placerville, the town nearest to South Silver.